For years, these were the directions to the Heart Mountain Interpretive Center, but with the speed limit at 70 mph, people would often pass right by the site. Tucked within agricultural fields set far back from the highway, the interpretive center is a series of low-profile structures in the landscape. The foundation prioritized a new sign that would increase roadside visibility while reinforcing the identity of the interpretive center. There was the basic technical requirement of sizing letters large enough for people to read while traveling from a distance at high speeds. Each of the components – letters, form, color, materials – is simple, yet purposefully detailed, and when combined, creates a powerful overall narrative. A historic photo inspired the design concept of white letters on a black background. Based on the original block letters from the camp sign, a custom typeface by graphic designer Julian Kelly is juxtaposed with the Futura font from the 1942 “Instructions to All Persons of Japanese Ancestry” poster. The sign’s black background is a long rectangle that recalls the tar-paper barracks, while the vertical posts reference the fencing that once enclosed the camp. A symbol for the entire experience of incarceration, relocation, and homesteading, the black signface extends past the vertical posts toward the highway as if in motion – a tribute to both the incarcerees as they were released from the camp at the end of the war and to the homesteaders that moved barracks to new locations. Distinctly contemporary in character, the sign expresses the foundation’s relevance today as a leader in racial justice issues. Built of industrial aluminum and galvanized steel I-beams by Production Machine Inc., the sign is engineered to withstand the area’s high wind forces. 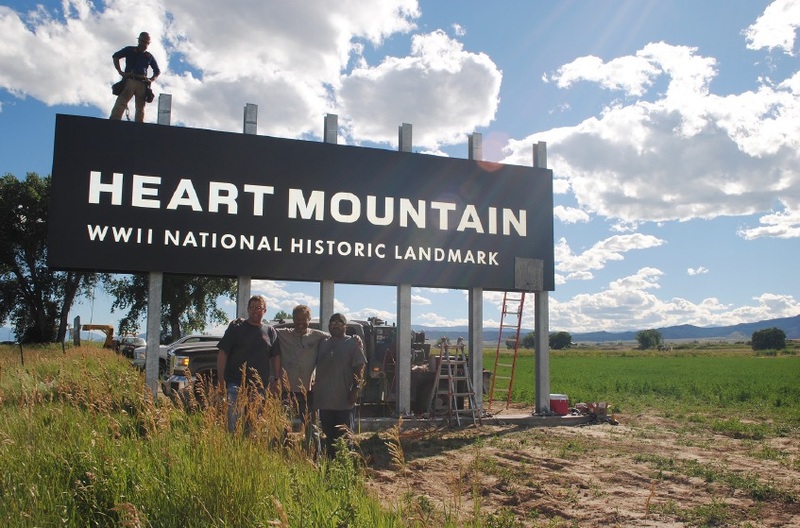 Fabricated in six months, the sign was installed just in time for this year’s Heart Mountain Pilgrimage. Measuring 8 feet tall by 30 feet long, it is positioned in the agricultural field perpendicular to the highway, visible to travelers from both Cody and Powell. For more information about the Heart Mountain Wyoming Foundation, write to 1539 Road 19, Powell, WY 82435, call (307) 754-8000, or go online to www.heartmountain.org.